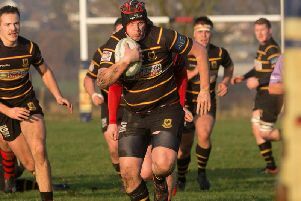 Harrogate Pythons consolidated their position at the top of Yorkshire Three with a hard-earned victory over third-placed Thornensians. The first scrum of the day saw the home front row Nathan Wake, Dan Shortman and Steve Smith put pressure on their opposite numbers and set the tone for the afternoon. The ball squirted out of the retreating Thorne scrum and Jon Pickard claimed the loose ball but his offload was knocked-on. Next, Max Sharp managed to make an interception in midfield but was pulled back for offside. Ross Fallenstein put in a big clearance kick and Luke Price-Gerrard pinched Thorne line-out ball, Tom Breakwell threw a neat pass to put Sharp through a gap. He drew the full-back and put Ivan Drane away on the outside, the latter scampering away to make it 5-0 after 10 minutes. 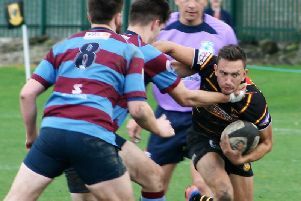 Thorne were then penalised for taking out Pythons scrum-half Andy MacKay at a ruck, but Breakwell’s long-distance penalty attempt fell below the bar. ‘Gate started the second half strongly, Tom Everingham winning turnover ball and Fallenstein making a break down the blind side before being bundled into touch. More Pythons pressure at the scrum forced Thorne into a hurried clearance but the hosts suffered a blow when Wake had to leave the field injured. Replacement Jack O’Hara kept up the scrum pressure, however some resolute defensive play by the visitors kept ‘Gate at bay. A Thorne clearance kick was then superbly kept in play by Drane, and Fallenstein made good yardage leading to a long-range penalty kick by Breakwell which again fell agonisingly under the bar. Excellent play by Pickard and Matt Leach set up attacking ball five metres out, however O’Hara was caught in possession and Thorne worked their way upfield, forcing the home pack to repel a series of five-metre scrums. With the visitors suddenly on top, they set up a driving maul. Pythons player-coach Dan Bird stole the ball, but a fracas broke out resulting in a red card for a Thorne man and yellows for Sharp and O’Hara. With the away side camped on the hosts’ line, another driving maul was penalised when a Thorne player ran into his own man. Another driving maul was stopped short soon afterwards, so the visitors went wide but one of their centres was halted before he could make it over the line and the match finished with the Pythons’ narrow lead still intact.